Please note, your free delivery may take between 5-15 days, see shipping and delivery for more details. Also, please review the size guide. Fallout has a cult like following. For good reason, this video game series is amazing. 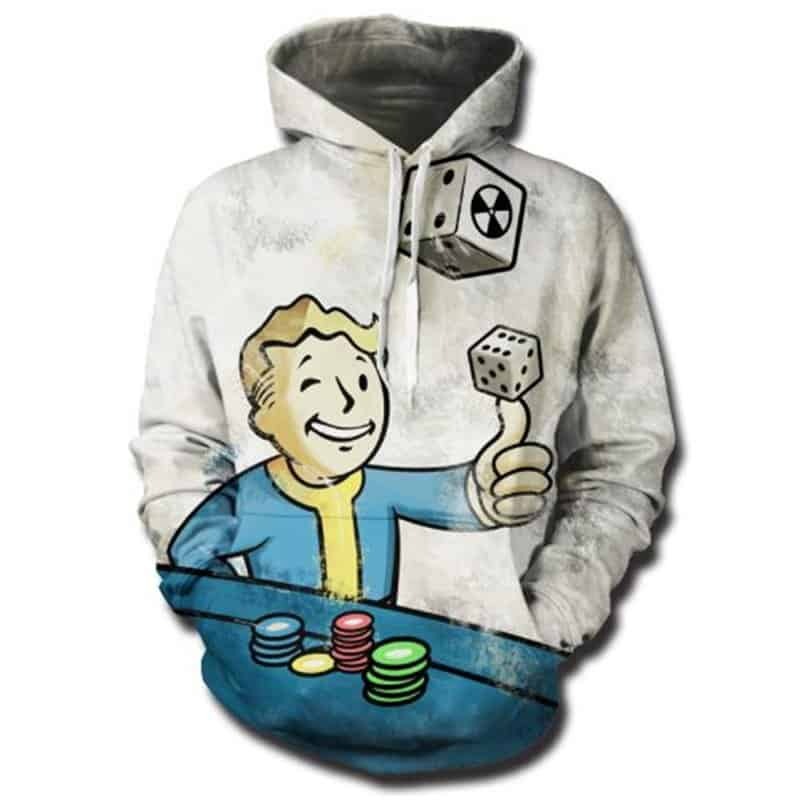 This Fallout Hoodie features the iconic mascot of the game with his thumb up while flicking some dice in the air. A must have hoodie for any fan of the Fallout game series. The hoodie is comfortable to wear, looks fashionable and is wearable anywhere. It was designed for both male and female. It is important to get the right size for your hoodie, please measure yourself before purchasing. We have provided a detailed table below of measurements. Please allow 1-3 CM (0.39-1.18 inches) error because of manual measuring. The size guide is tailored for EU / US / UK / AU please take this into account. Our hoodies are unisex, so ladies please take this into account when selecting your size. Finally, please note that our hoodies are polyester and spandex which means they are more elastic than cotton hoodies. If you are still unsure about what size to get, you may provide us with your weight, height and waist information and we can help you choose the correct size. To do this, please contact our customer support team at [email protected]. Our hoodies were manufactured to give a comfortable, light and loose fit. All our hoodies use a polyester and spandex combination with a cotton neckline. This combination allows for the prints as doing full prints on cotton is ineffective and incredibly expensive. The polyester / spandex material is effective though. The prints look crisp in real life because of this combination. However, there may be slight variations in colours due to lighting effects during photo taking or your monitor settings. The hoodie may be washed by machine, please read the label for further instructions. In general, even after 100s of washes, the colour should not fade. нанесённого poor quality, material synthetic. Толстовка хорошего качества. Удобная, мягкая, не “синтетика”. По названию ролика на скриншотах можно найти распаковку посылки и примерку толстовочки. bit different then photo. sythetic. but otherwise good. Yes. We provide free shipping to over 200 countries around the world. However, there are some location we are unable to ship to. If you happen to be located in one of those countries we will contact you and provide a full refund. We are not responsible for any custom fees or taxes once the items have shipped. By purchasing our products, you consent that one or more packages may be shipped to you and may get custom fees when they arrive to your country. Yes, you will receive an email once your order ships that contains your tracking information, but sometimes due to free shipping tracking is not available. For some shipping companies, it takes 2-5 business days for the tracking information to update on the system. For logistical reasons, items in the same purchase will sometimes be sent in separate packages, even if you’ve specified combined shipping. If you have any other questions, please contact us and we will do our best to help you out. We sell trendy niche hoodies and sweatshirts. Our hoodie range has been carefully selected to provide a range of stylish options. Our customers enjoy free shipping worldwide.